The classic holiday cookie with chocolate chips, cherry preserves and toasted walnuts. Line large baking sheet with parchment paper. Mix sugar and cinnamon in small bowl. Roll out 1 dough disk on floured surface to 9-inch round. Spread 3 tablespoons cherry preserves over dough, leaving 1-inch border. Sprinkle with 2 tablespoons chocolate chips, 2 tablespoons cinnamon sugar and 2 tablespoons walnuts. Press filling firmly to adhere to dough. Cut dough round into 8 equal wedges. Starting at wide end of each wedge, roll up tightly. Arrange cookies, tip side down, on prepared baking sheet, spacing 1 1/2 inches apart and bending slightly to form crescents. Repeat 3 more times with remaining dough disks, preserves, chocolate chips, cinnamon sugar and walnuts. Place baking sheet in freezer 30 minutes. Position rack in center of oven and preheat to 375°F. Brush cookies lightly with whipping cream. Bake frozen cookies until golden brown, about 40 minutes. Transfer cookies to racks and cool completely. 13 comments on "Chocolate Chip, Cherry, and Walnut Rugelach"
I made pinwheels today out of the left over dough from my coconut cream pie. Does that count?? Cherry are my favorites. I LOVE cream cheese pastry. Oy vey, those do look good! 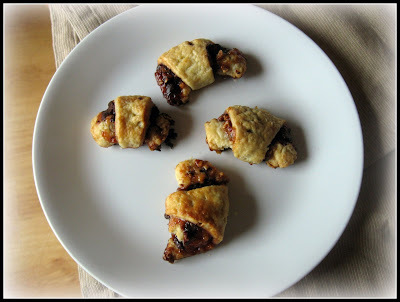 I love rugelach but have never attempted to make them. You did a superb job! Cool Emiline! I can always look to your site for things I've never made before. Rugelach sound yummy! I don't even know how to pronounce it! chocolate chipotle biscochitos...wow excellent recipe. I'm pretty sure I've never had rugelach before, much less made it!! It sounds like a wonderful treat, though! Yum! Those are the best combos ever! I don't know about you but when I bake, I have the intention of baking it for someone else, but most of the time I end up eating more than I should. lol. I still haven't tried one. I get out of class in 20 minutes. so now I am really worried. I never want to go through that again. I really need to start my own blog..I am still trying to come up with a decent name though..I have sort of a theme in mind and I want the name to go with it. I have some work I need to do. I'll see you when I get home. I just voted for you on leftover queen. Julie- I think that counts. I love coconut cream pie. It might be my favorite after pecan and blueberry. Sue- I'm sick of people saying that they don't like cherries. People like them, and they don't even know it. I like the cream cheese pastry, too. This one was pretty sticky, though. Annie- You would be a putz not to try making these! Cara- You should! Happy Hanukkah to you and your husband! Doggybloggy- No excuses necessary. I'm guilty of not visiting yours in awhile. Deb- This was my first time, too. I can't wait for you to start your blog! If you need help, let me know. I'm sooo going to link to you. Ooo... 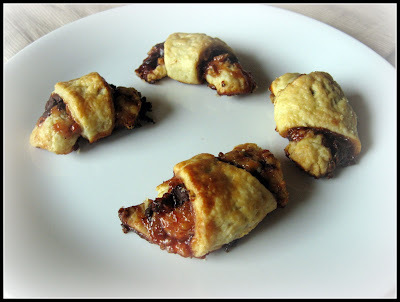 I love cherry and chocolate, and have been wanting to try rugelach. Happy Chanukah to you, too! Beautiful site, I'll be spending much time here. It's my first visit. Love it! !